1. I'm Waiting For The Man (4:45) / 2. Femme Fatale (2:36) / 3. Run Run Run (4:19) / 4. Heroin (7:09) / 5. All Tomorrow's Parties (5:57) / 6. I'll Be Your Mirror (2:08) / 7. White Light/White Heat (2:45) / 8. Stephanie Says (2:50) / 9. What Goes On (4:51) / 10. Beginning To See The Light (4:37) / 11. Pale Blue Eyes (5:39) / 12. I Can't Stand It (3:22) / 13. Lisa Says (2:55) / 14. Sweet Jane (3:14) / 15. Rock And Roll (4:36). Compiled by Bill Levenson, digitally mastered by Dennis Drake and Greg Calbi from the original masters. Liner notes by Anthony DeCurtis. Photo and design consultant: Gerard Malanga. Front & back cover collage: Audrey Bernstein. Art direction: Margery Greenspan. All Tomorrow's Parties is the double-tracked vocal version. 10 seconds fade-outs on I'm Waiting For The Man and Beginning To See The Light (as compared with the 1986 CD edition versions). 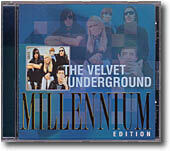 The 3rd album tracks are Val Valentin's mix versions. Also released as vinyl LP and audio cassette. 1. Run Run Run (4:19) / 2. I'm Waiting For The Man (4:45) / 3. Lisa Says (2:55) / 4. Sweet Jane (3:14) / 5. Femme Fatale (2:36) / 6. I'll Be Your Mirror (2:08) / 7. White Light/White Heat (2:45) / 8. What Goes On (4:51) / 9. Beginning To See The Light (4:37) / 10. I Can't Stand It (3:22) / 11. All Tomorrow's Parties (5:57) / 12. Rock And Roll (4:36). 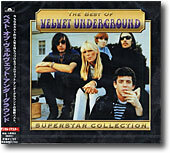 Part of the "SUPER STARS BEST COLLECTION" series. Same re-mastering as on Polygram's The Best Of with unedited versions of Waiting, What Goes On and Beginning.The cover shows early 70s blue-light photograph of Lou live. 1. I'll Be Your Mirror (2:12) / 2. Lady Godiva's Operation (4:55) / 3. What Goes On (4:35) / 4. The Fairest Of The Seasons (4:08) / 5. Some Kind Of Love (3:38) / 6. The Gift (8:18) / 7. Winter Song (3:19) / 8. Jesus (3:21) / 9. I'm Set Free (4:04) / 10. Wrap Your Troubles In Dreams (5:09) / 11. It Was A Pleasure Then (8:03 / 12. That's The Story Of My Life (2:03) / 13. Eulogy To Lenny Bruce (3:48) / 14. After Hours (2:08) / 15. Chelsea Girl (7:24) / 16. The Murder Mystery (8:35). 1. Pale Blue Eyes (5:39) / 2. Beginning To See The Light (4:37) / 3. What Goes On (4:51) / 4. White Light/White Heat (2:45) / 5. Sunday Morning (2:50) / 6. I'm Waiting For The Man (4:45) / 7. Femme Fetale (sic!) (2:36) / 8. Venus In Furs (5:05) / 9. Run, Run, Run (4:19) / 10. All Tomorrow's Parties (5:57) / 11. Heroin (7:09) / 12. I Can't Stand It (3:22) / 13. Stephanie Says (2:50) / 14. She's My Best Friend (2:45) / 15. Andy's Chest (2:48) / 16. Sweet Jane (Live) (3:59) / 17. Rock & Roll (Live) (6:04). Part of mid-price Startrax series, marketed in Australasia by Polygram. All Tomorrow's Parties is the single-voice version. 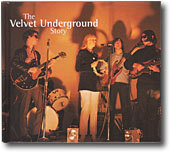 Tracks 16 and 17 are live recordings from 1969 Live. 1. I'm Waiting For The Man / 2. Femme Fatale / 3. Chelsea Girl / 4. Candy Says / 5. Venus In Furs / 6. Heroin / 7. White Light/White Heat / 8. The Gift. Part of "Il Grande Rock De Agostini" series. 1. Sunday Morning (2:49) / 2. I'm Waiting For The Man (4:25) / 3. Venus In Furs (5:06) / 4. Candy Says (4:25) / 5. Pale Blue Eyes (5:36) / 6. Beginning To See The Light (4:22) / 7. Satellite Of Love / 8. Nowhere At All / 9. Vicious / 10. Perfect Day / 11. Walk On The Wild Side / 12. How Do You Think It Feels / 13. Sweet Jane (Live) / 14. White Light/White Heat (Live) / 15. Sally Can't Dance / 16. Wild Child / 17. I Love You / 18. Berlin / 19. Coney Island Baby / 20. I Love You Suzannne. 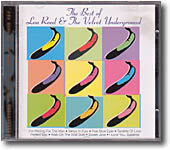 1-6: The Velvet Underground / 7-20: Lou Reed. Concept and compilation: Nic Moran. Design: Mental Block. 8-page booklet with liner notes and photos. 1. I'm Waiting For The Man (4:38) / 2. Run, Run, Run (4:20) / 3. Heroin (7:10) / 4. White Light/White Heat (2:44) / 5. Sister Ray (17:22) / 6. Beginning To See The Light (4:38) / 7. What Goes On (4:52) / 8. Pale Blue Eyes (4:38) / 9. I Can't Stand It (3:21) / 10. Sweet Jane live (3:58) / 11. Rock And Roll live (6:02). Part of the "20th CENTURY masters" series. Compilation produced by Bill Levenson. 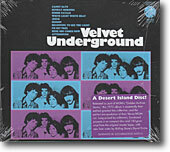 Mastered by Bob Ludwig at Gateway Mastering, Portland, Maine and Jeff Willens at Universal Mastering Studios East. Art direction: Vartan. Design: Mike Fink @ilevel. Photo research: Jason Pastori. 8-page folded insert with notes by Joseph F. Laredo and photos from Polydor Arhive and by Gerard Malanga, Billy Name and Lisa Law. 1. I'm Waiting For The Man (4:37) / 2. Run, Run, Run (4:20) / 3. Heroin (7:10) / 4. White Light/White Heat (2:44) / 5. Sister Ray (17:27) / 6. Beginning To See The Light (4:38) / 7. What Goes On (4:52) / 8. Pale Blue Eyes (5:38) / 9. I Can't Stand It (3:21) / 10. Sweet Jane live (4:00) / 11. Rock And Roll live (6:05). Part of the "Universal Masters Collection" series. Co-ordinated by Melanie Crowe and Richard Ganter. Liner notes by Daryl Easlea. 12-page booklet with 1966 photo by Gerard Malanga and liner notes by Daryl Easlea. 1. I'm Waiting For The Man (4:37) / 2. Run, Run, Run (4:20) / 3. Heroin (7:10) / 4. White Light/White Heat (2:44) / 5. Sister Ray (17:27) / 6. Beginning To See The Light (4:38) / 7. What Goes On (4:52) / 8. Pale Blue Eyes (5:38) / 9. I Can't Stand It (3:21) / 10. Sweet Jane (Live) (4:00) / 11. Rock And Roll (Live) (6:05). Part of the French "Les Talents du Siècle" series. Limited edition, Digitally remastered SBM (Super Bit Mapping). Digipak. 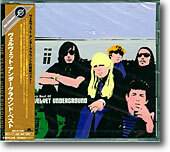 Chinese edition of the Rock & Roll compilation with CD in cardboard slipcase. 12-page booklet with photos by Gerard Malanga from The Castle 1966 and with liner notes in English (same text as UK edition). The front of both booklet and slipcase with new Castle photo different from the well-known shot used for the front of the UK edition. The Chinese CD is actually offering 17 tracks instead of 16!!! 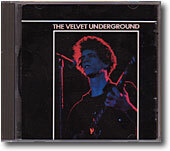 Before Temptation Inside Your Heart is a not listed "bonus track" - 9:45 of silence - actually both 1st and 3rd Velvet Underground albums in mp3 form. 1. I'm Waiting For The Man / 2. Run Run Run / 3. Heroin / 4. Femme Fatale / 5. White Light/White Heat / 6. Sister Ray / 7. Jesus / 8. Here She Comes Now / 9. Beginning To See The Light / 10. What Goes On / 11. Pale Blue Eyes / 12. Lady Godiva's Operation / 13. I Can't Stand It / 14. Sweet Jane (Live) / 15. Rock And Roll (Live). Part of the 'Superstar Collection'. 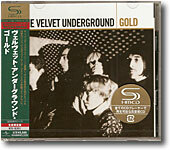 Japanese exclusive compilation featuring 15 tracks including live versions of Sweet Jane & Rock And Roll. 32 bit digitally remastered. 1. Heroin / 2. Rock & Roll / 3. Candy Says / 4. I'm Waiting For The Man / 5. Femme Fatale / 6. Sweet Jane / 7. There She Goes Again / 8. Here She Comes Now / 9. What Goes On / 10. Sister Ray / 11. White Light/White Heat / 12. Who Loves The Sun / 13. Pale Blue Eyes / 14. Oh! Sweet Nuthin'. 1. Sweet Jane (4:07) / 2. I'm Sticking With You (2:29) / 3. I'm Waiting For The Man (4:42) / 4. What Goes On (4:33) / 5. White Light/White Heat (2:47) / 6. All Tomorrow's Parties (5:59) / 7. Pale Blue Eyes (5:44) / 8. Femme Fatale (2:40) / 9. Heroin (7:11) / 10. Here She Comes Now (2:03) / 11. Stephanie Says (2:51) / 12. Venus In Furs (5:10) / 13. Beginning To See The Light (4:48) / 14. I Heard Her Call My Name (4:38) / 15. Some Kinda Love (3:40) / 16. I Can't Stand It (3:23) / 17. Sunday Morning (2:55) / 18. Rock And Roll (4:49). 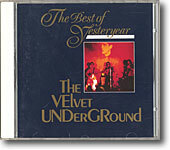 CD in slipcase. 16-page booklet with liner notes by Daryl Easlea. Sleeve: M4 Design. Photography: ©Gerard Malanga. The Japanese edition comes with obi. 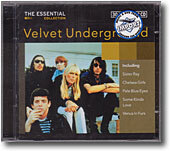 Sweet Jane is the full-length version - same as Peel Slowly And See and Fully Loaded. I'm Sticking With You is the May 13, 1969 version - and not the 1970 Loaded sessions version as could let think the sticker on slipcase which says "Includes "I'm Sticking With You" (from the Hyundai TV advert)". 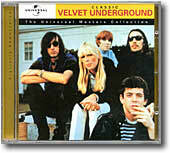 What Goes On, Pale Blue Eyes, Beginning To See The Light and Some Kinda Love are Lou Reed 'closet' mix versions. All Tomorrow's Parties is the 'double voice' version. Disc one: 1. I'm Waiting For The Man (4:39) / 2. Femme Fatale (2:39) / 3. Venus In Furs (5:12) / 4. Run Run Run (4:22) / 5. All Tomorrow's Parties (5:59) / 6. Heroin (7:12) / 7. There She Goes Again (2:41) / 8. I'll Be Your Mirror (2:14) / 9. Sunday Morning (2:56) / 10. Chelsea Girls (Performed by Nico) (7:26) / 11. It Was A Pleasure Then (8:06) / 12. White Light/White Heat (2:48) / 13. I Heard Her Call My Name (4:38) / 14. Sister Ray (17:27). Disc two: 1. Temptation Inside Your Heart (2:31) / 2. Stephanie Says (2:50) / 3. Hey Mr. Rain (Version One) (4:39) / 4. Candy Says (4:02) / 5. What Goes On (4:52) / 6. Some Kinda Love (4:03) / 7. Pale Blue Eyes (5:38) / 8. Beginning To See The Light (4:39) / 9. Foggy Notion (6:47) / 10. I Can't Stand It (3:21) / 11. One Of These Days (3:59) / 12. Lisa Says (2:57) / 13. New Age (Live) (6:36) / 14. Rock And Roll (Live) (6:06) / 15. Ocean (Live) (10:55) / 16. Sweet Jane (Live) (4:00). 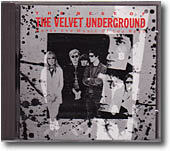 20-page booklet with liner notes by Scott Schinder and photos by Billy Name, Suzan Cooper, Nat Finkelstein and others. Stephanie Says and Temptation Inside Your Heart are previously unrelased original mixes. 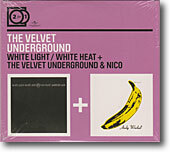 Hardback long box including the 1996 US discs of The Velvet Underground & Nico (Polygram 31453 1250 2), White Light/White Heat (Polygram 31453 1251 2), and The Velvet Underground (Polygram 31453 1252 2). 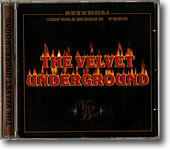 The CD booklets from the original releases are included. Disc one: 1. I'm Waiting For The Man (4:39) / 2. Femme Fatale (2:39) / 3. Venus In Furs (5:12) / 4. Run Run Run (4:22) / 5. All Tomorrow's Parties (5:59) / 6. Heroin (7:12) / 7. There She Goes Again (2:41) / 8. I'll Be Your Mirror (2:14) / 9. Sunday Morning (2:56) / 10. Chelsea Girls (7:26) / 11. It Was A Pleasure Then (8:06) / 12. White Light/White Heat (2:48) / 13. I Heard Her Call My Name (4:38) / 14. Sister Ray (17:27). 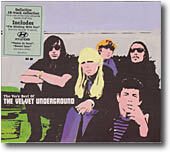 European edition of The Velvet Underground Gold collection with alternate hardback cover artwork, 28-page booklet with liner notes by Daryl Easlea, well illustrated with photos and memorabilia. 1. Sunday Morning / 2. I'm Waiting For The Man / 3. Femme Fatale / 4. Venus In Furs / 5. Run Run Run / 6. All Tomorrow's Parties / 7. Heroin / 8. I'll Be Your Mirror / 9. 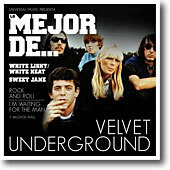 White Light/White Heat / 10. Temptation Inside Your Heart / 11. Stephanie Says / 12. Candy Says / 13. What Goes On / 14. Some Kinda Love / 15. Pale Blue Eues / 16. Beginning To See The Light / Hey Mr. Rain (live) / 18. Rock And Roll (live). 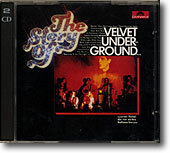 Single CD edition of The Velvet Underground Story (Universal 06024 9836389 (8)). Hardback cover booklet. 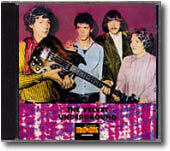 Dutch edition of The Velvet Underground Gold collection with alternate artwork. CD1: 1. Venus In Furs (5:13) / 2. I'm Sticking With You (2:30) / 3. Heroin (7:13) / 4. Chelsea Girls (7:27) / 5. Coney Island Steeplechase (2:29) / 6. Ferryboat Bill (2:14) / 7. Winter Song (3:20) / 8. Jesus (3:25) / 9. Temptation Inside Your Heart (2:32) / 10. That's The Story Of My Life (2:05) / 11. Hey Mr. Rain (4:43) / 12. It Was A Pleasure Then (8:06) / 13. We're Gonna Have A Real Good Time Together (3:00) / 14. The Gift (8:19) / 15. I'm Waiting For The Man - Live (7:49) / 16. White Light/White Heat (2:48) / 17. Pale Blue Eyes (5:39). CD2: 1. Sunday Morning (2:58) / 2. Femme Fatale (2:41) / 3. Black Angel's Death Song (3:14) / 4. Candy Says (4:06) / 5. Run Run Run (4:22) / 6. Lisa Says (2:58) / 7. Heroin - Live (8:14) / 8. Here She Comes Now (2:05) / 9. Rock And Roll - Live (6:53) / 10. Stephanie Says (2:52) / 11. Foggy Notion (6:41) / 12. Little Sister (4:27) / 13. Femme Fatale - Live (3:18) / 14. Ocean - Live (10:59) / 15. European Son (7:49) / 16. There She Goes Again (2:42) / 17. After Hours (2:09). CD3: 1. I'm Waiting For The Man (4:41) / 2. All Tomorrow's Parties (6:01) / 3. Beginning To See The Light (4:41) / 4. One Of These Days (4:02) / 5. Pale Blue Eyes - Live (5:54) / 6. Some Kinda Love (4:05) / 7. I Can't Stand It (3:24) / 8. What Goes On (4:56) / 9. Wrap Your Troubles In Dreams (5:10) / 10. Lisa Says - Live (5:55) / 11. The Murder Mystery (8:57) / 12. I Heard Her Call My Name (4:39) / 13. Lady Godiva's Operation (4:57) / 14. I'm Set Free (4:05) / 15. Sweet Jane - Live (4:03) / 16. I'll Be Your Mirror (2:13). French release only, part of "Les 50 Plus Belles Chansons" series. Gatefold in cardboard slip cover. I'm Sticking With You is the May 13, 1969 version. Hey Mr. Rain is version I. I'm Waiting For My Man - Live, Heroin - Live, Rock And Roll - Live, Femme Fatale - Live are from Bootleg Series Volume 1: The Quine Tapes. 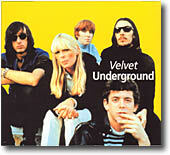 Ocean - Live, Pale Blue Eyes - Live, Lisa Says - Live, Sweet Jane - Live are from 1969 Velvet Underground Live. 1. White Light/White Heat (2:45) / 2. Sunday Morning (2:53) / 3. Run Run Run (4:20) / 4. Heroin (7:05) / 5. There She Goes Again (2:30) / 6. What Goes On (4:52) / 7. Temptation Inside Your Heart (2:30) / 8. Some Kinda Love (4:03) / 9. Rock And Roll (6:49) / 10. I Can't Stand It (3:23) / 11. Foggy Notion (6:49) / 12. Femme Fatale (3:14) / 13. New Age (11:18) / 14. Here She Comes Now (2:02) / 15. Beginning To See The Light (4:38). 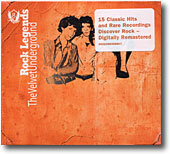 "15 Classic Hits and Rare Recordings Discover Rock - Digitally Remastered". 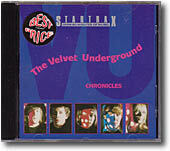 #8 in Universal International's Rock Legends series. Digipak. Reissue of the 1989 collection in Ecopacs. Every part of the product has been taken into account when considering its environmental impact. Instead of the typical plastic jewel case, the Ecopacs are formed of a Paperfoam® tray and recycled board that are paper-recyclable and biodegradable. To further reduce environmental impact no booklets will be included, but instead will be available to download or direct from Universal Music. 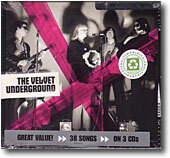 The CD itself is 70% recyclable as the polycarbonate used for its manufacturing needs to stay 100% pure. Disc 1: 1. I'm Waiting For The Man (4:39) / 2. Femme Fatale (2:39) / 3. Venus In Furs (5:10) / 4. Run Run Run (4:21) / 5. All Tomorrow's Parties (5:59) / 6. Heroin (7:10) / 7. There She Goes Again (2:41) / 8. I'll Be Your Mirror (2:13) / 9. Sunday Morning (2:55) / 10. These Days (3:34) / 11. Little Sister (4:25) / 12. Winter Song (3:20) / 13. It Was A Pleasure Then (8:03) / 14. Chelsea Girls (7:26) / 15. Wrap Your Troubles In Dreams (5:08). Disc 2: 1. White Light/White Heat (2:46) / 2. Here She Comes Now (2:03) / 3. I Heard Her Call My Name (4:38) / 4. Sister Ray (17:30) / 5. Stephanie Says (2:51) / 6. Temptation Inside Your Heart (2:32) / 7. Hey Mr. Rain (Version One) (4:42) / 8. Candy Says (4:05) / 9. What Goes On (4:54) / 10. Beginning To See The Light (4:40) / 11. Pale Blue Eyes (5:41) / 12. Some Kinda Love (4:01). Disc 3: 1. Foggy Notion (6:50) / 2. I Can't Stand It (3:24) / 3. I'm Sticking With You (2:28) / 4. One Of These Days (3:58) / 5. Lisa Says (2:58) / 6. We're Gonna Have A Real Good Time Tohether (2:57) / 7. I'm Gonna Move Right In (6:30) / 8. Rock And Roll (Live) (6:07) / 9. Sweet Jane (4:08) / 10. New Age (5:06) / 11. Ocean (5:45). Compilation produced by Bill Levenson. Mastered by Tom Withelock and Ellen Fitton. Part of Universal Playlist Plus series. Part of Star-Club Universal budget series. Disc 1: 1. White Light/White Heat / 2. The Gift / 3. Lady Godiva's Operation / 4. Here She Comes Now / 5. I Heard Her Call My Name / 6. Sister Ray. Disc 2: 1. Sunday Morning / 2. I'm Waiting For The Man / 3. Femme Fatale / 4. Venus In Furs / 5. Run Run Run / 6. All Tomorrow's Parties / 7. Heroin / 8. There She Goes Again / 9. I'll Be Your Mirror / 10. Black Angel's Death Song / 11. European Son. Part of "2 for 1" budget series. 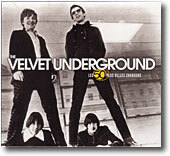 2CD, Polydor 523706-2, Germany, ? CD 1: 1. I'm Waiting For The Man / 2. Candy Says / 3. Run Run Run / 4. White Light/White Heat / 5. All Tomorrow's Parties / 6. Sunday Morning / 7. I Heard Her Call My Name / 8. Femme Fatale / 9. Heroin / 10. Here She Comes Now / 11. There She Goes Again. CD 2: 1. Sister Ray / 2. Venus In Furs / 3. European Son / 4. Pale Blue Eyes / 5. Black Angel's Death Song / 6. Beginning To See The Light. 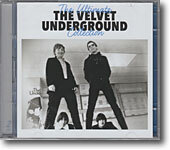 CD reissue of the 1978 German 2-LP compilation (Polydor 2664 405). 1. I'm Waiting For The Man / 2. White Light/White Heat / 3. I Can't Stand It / 4. Heroin / 5. Sunday Morning / 6. Sweet Jane (Live) / 7. Here She Comes Now / 8. Pale Blue Eyes / 9. Stephanie Says / 10. Rock And Roll (Live) / 11. Venus In Furs. Part of the 'Icon Series', "A new series of albums featuring the greatest hits of the most popular artists in music history, all at a great low price". CD1: 1. Prominent Men (Demo) / 2. I'm Waiting For The Man / 3. Venus In Furs / 4. All Tomorrow's Parties / 5. There She Goes Again / 6. Heroin / 7. Femme Fatale / 8. It Was A Pleasure Then* / 9. Chelsea Girls* / 10. The Fairest Of The Season*s / 11. These Days* / 12. Somewhere There's A Feather* / 13. Wrap Your Troubles In Dreams / 14. There Is No Reason (Demo) / 15. Sheltered Life (Demo) / 16. I Heard Her Call My Name / 17. White Light/White Heat. CD2: 1. Here She Comes Now / 2. Sister Ray / 3. Hey Mr. Rain / 4. Stephanie Says / 5. Temptation Inside Your Heart / 6. She's My Best Friend / 7. Andy's Chest / 8. Candy Says / 9. What Goes On / 10. Some Kinda Love / 11. Pale Blue Eyes / 12. The Murder Mystery / 13. After Hours / 14. We're Gonna Have A Real Good Time Together / 15. Foggy Notion / 16. Countess From Hong Kong. CD3: 1. Lisa Says / 2. I'm Sticking With You / 3. One Of These Days / 4. Who Loves The Sun / 5. Rock And Roll / 6. Sweet Jane / 7. New Age / 8. I Found A Reason / 9. Oh! Sweet Nuthin' / 10. Ocean / 11. Ride Into The Sun / 12. I Love You / 13. Guess I'm Falling In Love (Live) / 14. What Goes On (Live) / 15. It's Just Too Much (Live) // Bonus tracks / 16. You Forgot To Answer* / 17. The End*. Graphic design: Valentin Ocheda. Mastered by: QS Sound Lab. 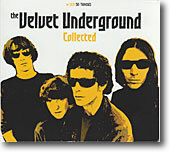 Part of Universal Music "Collected" series. 12-page booklet. 1. Candy Says / 2. Sunday Morning / 3. Femme Fatale / 4. White Light/White Heat / 5. Jesus / 6. Heroin / 7. Beginning To See The Light / 8. I'm Set Free / 9. Here She Comes Now / 10. Afterhours. 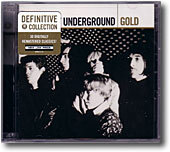 CD reissue of the Golden Archive Series LP (GAS-131) compilation. "A Desert Island Disc! Released as part of MGM's "Golden Archive Series," this 1970 album is essentially their earliest greatest hits collection, and the perfect encapsulation of their Verve/MGM run. Long prized by collectors, Sundazed presents it on compact disc and 180-gram vinyl from the original master tapes, with new liner notes by Rolling Stone's David Fricke." 1. I'm Waiting For The Man / 2. White Light/White Heat / 3. I Can't Stand It / 4. Sunday Morning / 5. Pale Blue Eyes / 6. Stephanie Says / 7. Venus In Furs / 8. Here She Comes Now / 9. Sweet Jane / 10. Rock And Roll / 11. Heroin. CD1: 1. Sweet Jane (Live From The Matrix, San Francisco, CA / 1969) (3:56) / 2. 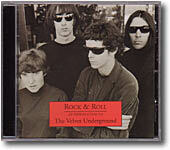 Rock And Roll (Live From The Matrix, San Francisco, CA / 1969) (6:05) / 3. Ocean (Live in San Francisco / 1969) (10:55) / 4. One Of These Days (3:58) / 5. I Can't Stand It (3:23) / 6. Foggy Notion (6:47) / 7. Some Kinda Love (4:03) / 8. What Goes On (4:52) / 9. Candy Says (Closet Mix) (4:04) / 10. Hey Mr. Rain (Version One) (4:40) / 11. Stephanie Says (Original Mix) (2:50) / 12. Temptation Inside Your Heart (Original Mix) (2:31) / 13. Sister Ray (17:27) / 14. I Heard Her Call My Name (4:35). CD2: 1. White Light/White Heat (2:45) / 2. It Was A Pleasure Then (8:00) / 3. Chelsea Girls (7:24) / 4. Sunday Morning (2:53) / 5. I'll Be Your Mirror (2:11) / 6. There She Goes Again (2:38) / 7. Heroin (7:05) / 8. All Tomorrow's Parties (5:55) / 9. Run Run Run (4:20) / 10. 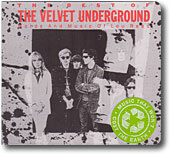 Venus In Furs (5:10) / 11. Femme Fatale (2:35) / 12. I'm Waiting For The Man (4:37) / 13. Lisa Says (2:54) / 14. Pale Blue Eyes (Closet Mix) (5:42). Thanks: Lau Buur Nielsen, Pieter de Jong, Alessandro Santamaria.